After a 2-under-par 70 Sunday, Australian Katherine Kirk put the finishing touches on her third LPGA Tour victory at the inaugural Thornberry Creek LPGA Classic. Kirk, who went 152 LPGA Tour starts between her last victory and Sunday, birdied the 72nd hole to finish at 22-under par, the lowest four-round tournament total in her career. Kirk had an up-and-down Sunday with four bogeys offset by six birdies, and was able to hold off all challengers including Sei Young Kim and Pornanong Phatlum, who shot rounds of 9-under and 10-under respectively. Ashleigh Buhai’s runner-up result was the best finish of her career and her first career top-10 on the LPGA. At 21-under par, the 28-year-old from South Africa also fired a new career-low tournament score to par shattering her previous low of -7. She also tied her career-low score of 66 in the second round and set a new career-low with her 7-under 65 in the third round. The 2008 LPGA rookie calmly holed her two-foot birdie putt on 18, following Kirk’s tournament-winning putt, to seal up second place alone after playing in the final group for the first time on the LPGA. “It was awesome,” Buhai said of the experience. “I felt I relished on it. From the first hole I started out with a birdie, and I just tried to keep feeding off it. I really enjoyed the support, and yeah, it was a lot of fun out there. 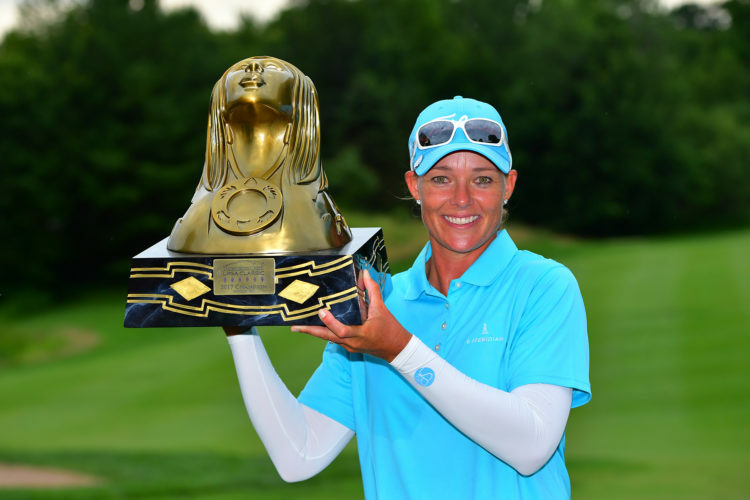 With Australia’s Katherine Kirk winning the Thornberry Creek LPGA Classic, the LPGA now has featured 17 different winners from eight different countries this season. Katherine Kirk is the first player from Australia to win since Minjee Lee won the 2016 LPGA Blue Bay. Last season, the Tour had 18 different winners representing 12 different countries, and a total of nine players with multiple wins (three with 3+ wins). Through 18 events, the Republic of Korea’s So Yeon Ryu remains the only player with multiple victories on the LPGA in 2017.